I looked through the little girl clothes at Target for something with hearts, and I almost bought this dress, until I realized it was really more me than Stella. But why was I looking for clothes with hearts? I can sew! I can add hearts to clothes! 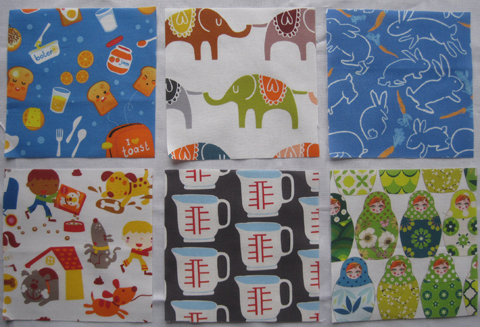 So I bought a simple T-shirt instead (and a Ladybug Girl book), and headed to my fabric stash to see what would work. 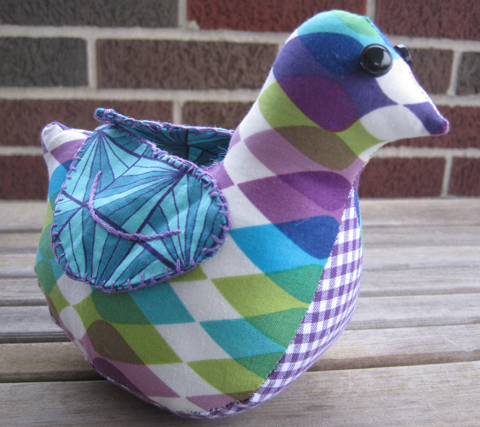 The colors in this bird fabric matched perfectly, and it meant I could put a bird and a heart on it! 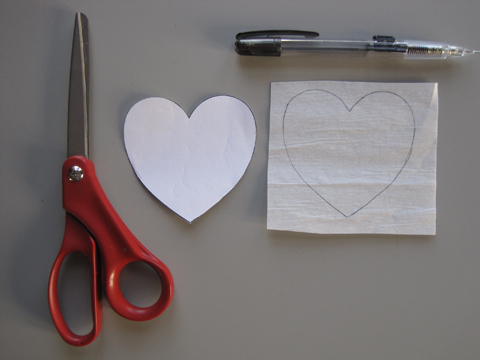 I Googled “heart templates” and found a size and shape I liked. I printed it out, and then cut out the shape. Next, I traced the shape onto one side of Lite Steam-A-Seam2, a double-stick fusible web. This is an applique paper that came highly recommended in a machine embroidery book I was recently editing, because it’s so lightweight and easy to use. 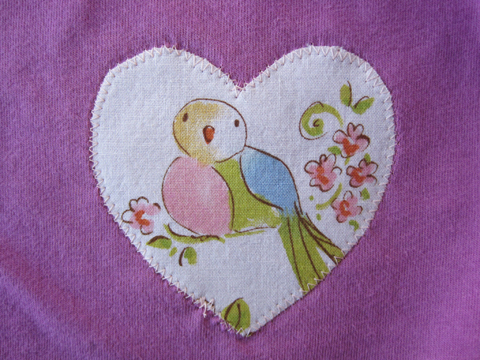 I then removed the paper on one side of the Steam-A-Seam and positioned the heart on the back of the bird fabric. The Steam-A-Seam is thin enough that I could easily see where on the bird I was placing the heart. 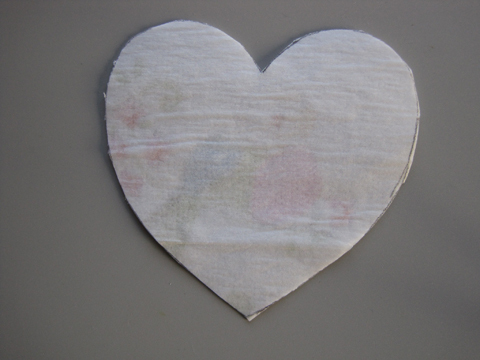 Then I cut the heart shape out of the fabric (and the paper). Next, I removed the paper from the heart and positioned it on the shirt. 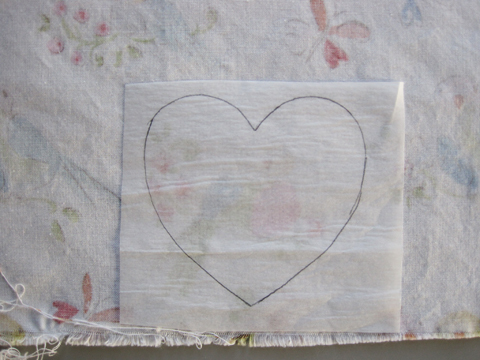 The stickiness isn’t permanent until its ironed, so I could move the heart around to find just the right spot. Once I did find the right spot, I ironed it down, and then zigzagged around the shape to finish it up. 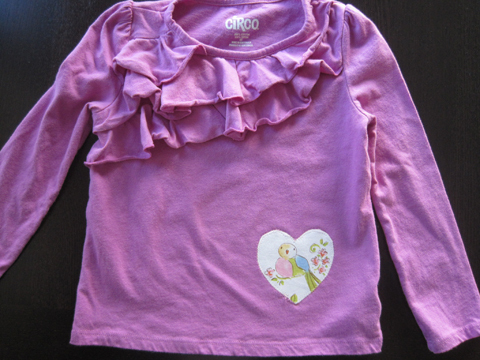 The Steam-A-Seam added barely any weight or stiffness to the shirt—which make it perfect for kids’ clothing. It seriously doesn’t get easier than that. Now I can put hearts and/or birds on anything! 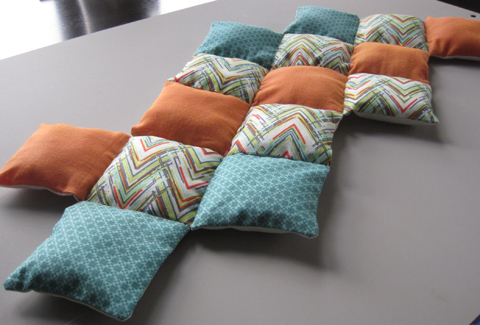 A few months ago, I wrote a post about a type of quilt my Grandma Horvath used to make. 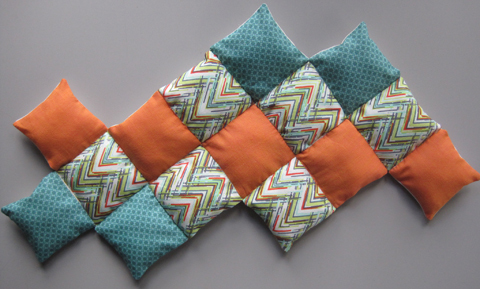 I’m not sure what she called it, so I decided to call it a pillow block quilt. Inspired by her handiwork, I decided to make one of my own. I have to admit, I didn’t do as much research on her quilt as I should have before diving into my own. First, I probably should have measured the blocks. In my first attempt, I cut the blocks to 4.5 inches, which would have given me a 4-inch block. It seemed really big—and it was; Grandma’s blocks came in at a little less than 3 inches. For the stuffing, I bought some high-loft polyester batting, but after stuffing a few of my blocks with that, it just didn’t seem right. Upon further inspection, Grandma must have used fiberfill (or cut up nylons). So, with all that figured out, I started in on the blocks I’ll actually use for the quilt. To get those 3-inch squares, I’ve been cutting my front and back fabric pieces to 3.5 x 3.75 inches. I sew the two long sides and one short side by machine and clip the corners. I turn the pocket right-side out and use my handy crochet hook to help me with the corners. 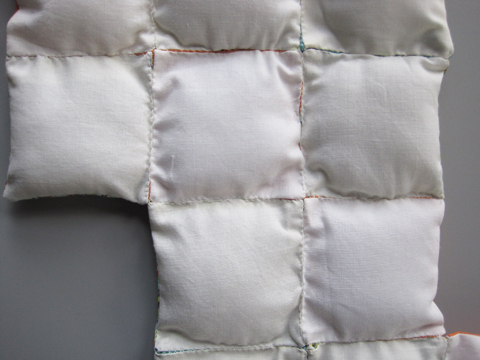 (Both my mom and I remember getting poked by the corners on Grandma’s quilts.) I do iron at this point for a nice, crisp pocket. 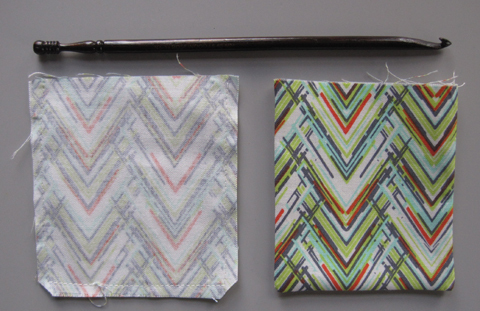 While my iron is out, I fold the open edges into the pocket to make the pocket 3 inches square, and press the folded edges. I was finding I was having a hard time folding over just 1/4 inch of fabric, so I added another little bit to that end to make the folding easier. I’m still working on figuring out the exact amount of fiberfill to put in each pocket. Some of my earlier ones are much puffier than recent ones, but I think I like them a little less full. I do make sure to break apart the fiberfill a bit, so I can push it into the corners of the pocket. Next comes the hand-sewing part of the process. I whipstitch the pocket closed. 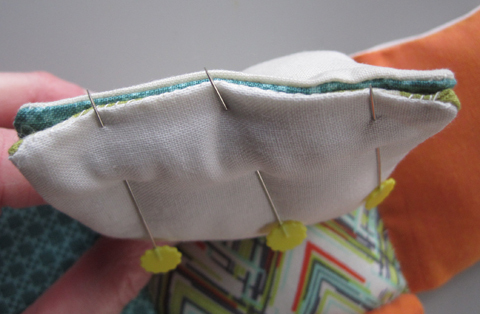 And then whipstitch this pocket to its adjoining pocket on the quilt. In looking at Grandma’s quilt, she may have been able to combine the sewing-closed step with this one, but I haven’t gotten that down yet, so I do it in two steps. Grandma made of all her pillow block quilts as trips around the world, so that’s what I’m doing as well. I honestly don’t have any idea how much fabric I’ll need. Right now, I’m using stash fabrics, but as the “trips” get longer, I may have to purchase some yardage. Grandma seemed to always use plain white or off-white fabrics for the back. 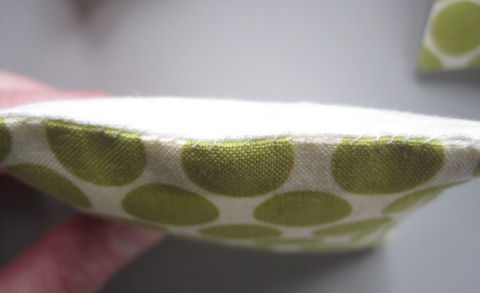 It shows some of the non-prettiness of my handstitching, but so it goes. I have to say, Grandma either had a lot more patience than I do, or she found a way to simplify the process better than I have. Because this quilt is going to take a while. I do like that handwork part of it, though. It’s really perfect for winding down before bed and keeping my hands busy while watching TV. I’ll keep you posted on the progress! The modern quilt world is gearing up for the first ever QuiltCon presented by The Modern Quilt Guild. It’s being held in Austin, Texas, February 21-24. And while I’m not going, several members of the Cincinnati Modern Quilt Guild will be there, including Heather Jones, CMQG founder, who will be lecturing on Everyday Inspiration in Modern Quilts. Besides on all the usual classes and lectures going on, there will be lots of getting-to-know-you types of events, too. 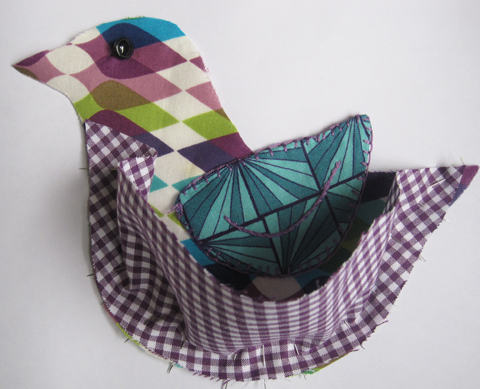 One of those is a pincushion swap, where members of one modern quilt guild make pincushions to swap with another guild. Teresa, a CMQG member going to the conference, is heading up the effort for the Cincinnati MQG. The great thing about this swap is it’s open to all MQG members, whether they’re attending the conference or not. It sounded like fun to me! 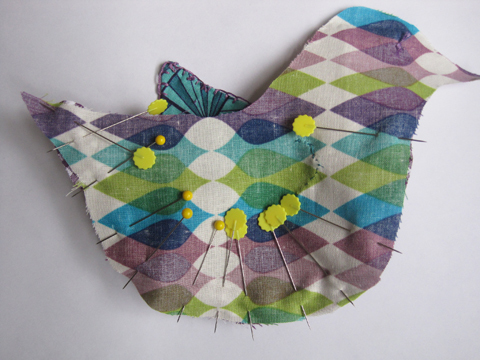 After a bit of thought, I decided to make a cute little bird pincushion from a pattern in Joel Dewberry’s Sewn Spaces book. I’d been wanting to make one ever since the book came out, and now was the perfect opportunity. The pattern has you start with the wings. First you cut out the wing pieces, embroider the feather swoop on the two outside pieces, and then sew the inside and outside wing pieces together. A blanket stitch around the wing finishes them off (and closes up the opening where you turned the wings right-side out). Next, I moved on to the body. I sewed the wings to each body piece, and sewed the eyes in place (although I ended up moving these once the guy was put together—they didn’t line up at all). Once that was done, it was time to pin the breast piece to the bodies. I think it’s always a little tricky to pin pieces that are dimensional, but the key is just to use a lot of pins. After that, I sewed on the second body piece, leaving a hole to turn and stuff. 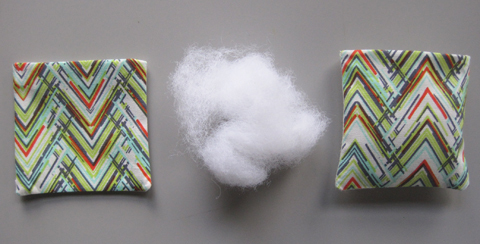 I’m always amazed by how much stuffing, in this case fiberfill, needs to go into something this small. It seemed like I was stuffing forever. But I did want him to be nice and firm. I started with little pieces of fiberfill for the beak, shaping each piece a bit before inserting it in place. Then I moved onto a head-size piece and lots and lots of neck pieces. I used smaller pieces for the tail, and then stuffed the body. Closing him up was a bit of chore because he was stuffed so full. And after looking at some of these pictures, I apparently need to go and remove some random fibers from the opening before he goes to his new home. Fly away, little bird friend! 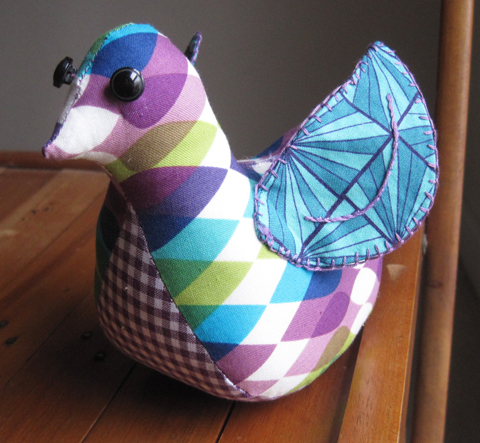 I hope you’ll get to liven up someone’s sewing room! 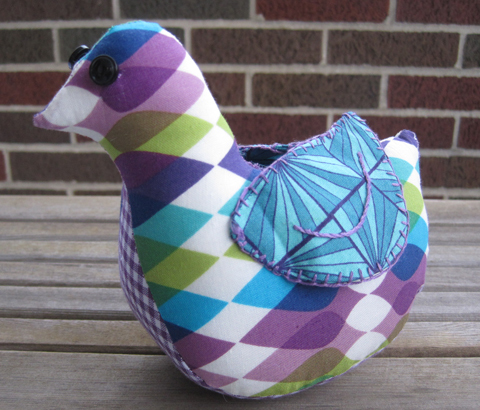 For those of you who don’t have access to Joel Dewberry’s Sewn Spaces, I did find the pattern for this bird online at The DIY Dish. Have fun making one of your own! I learn about the coolest things from my crafty friends. A little while back, one of my crafty Facebook friends, Rachael from Imagine Gnats, was helping to organize an online auction called Handmade for Newtown through From The Heart Auctions. She and her co-organizers solicited auction items from their crafty contacts, and they received some really, really cool stuff—some handmade items and some supplies. One of the many items to catch my eye—and the one that I ended up winning—was an awesome pack of I-Spy fabric squares using fabrics from Spoonflower. If you’re not familiar with Spoonflower, they’re a web site that allows people to design and print their own fabric (and wall decals and wallpaper). All you need to do is upload your design and select the type of fabric on which you want the design printed. Once the fabric is on the site, you can decide whether you want others to be able to buy your fabric or not. For this auction item, CrafterHours selected 56 Spoonflower fabrics that would be perfect in an I-Spy quilt and cut them into I-Spy-friendly 5-inch squares. 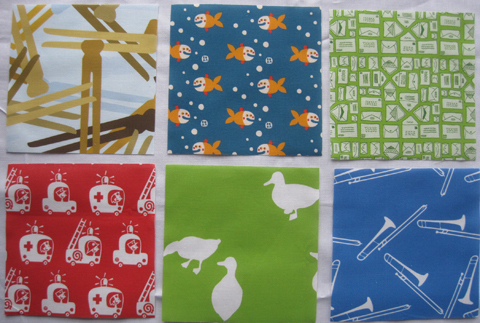 In addition to the set I got (titled Eden), they have two more I-Spy Spoonflower packs as well. There are so many cute designs. And I can’t tell you how much fun it was to open the pack and go through the fabrics, naming each one as I came to it. 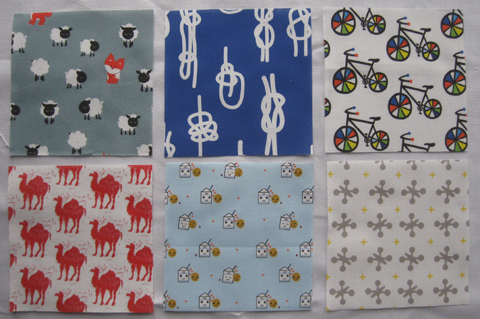 “Sheep and fox… knots… rainbow bicycles…” I can’t wait to get going on my I-Spy quilt!